Precision in dental components, such as dental implants, is extremely critical to the success of the procedure. Precise dimensional control of the implants themselves ensures a long-lasting fit and an optimum outcome for the patient. Dental implants are typically manufactured on Swiss turning equipment which produces the best dimensional results with ultra-precise ground titanium and stainless steel bar. 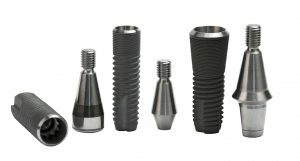 Precision ground titanium and stainless steel machining bars from Boston Centerless enable dental implant manufacturers to achieve excellent dimensional integrity on a production basis. For a complete list of materials that Boston Centerless supplies, visit our Materials page.